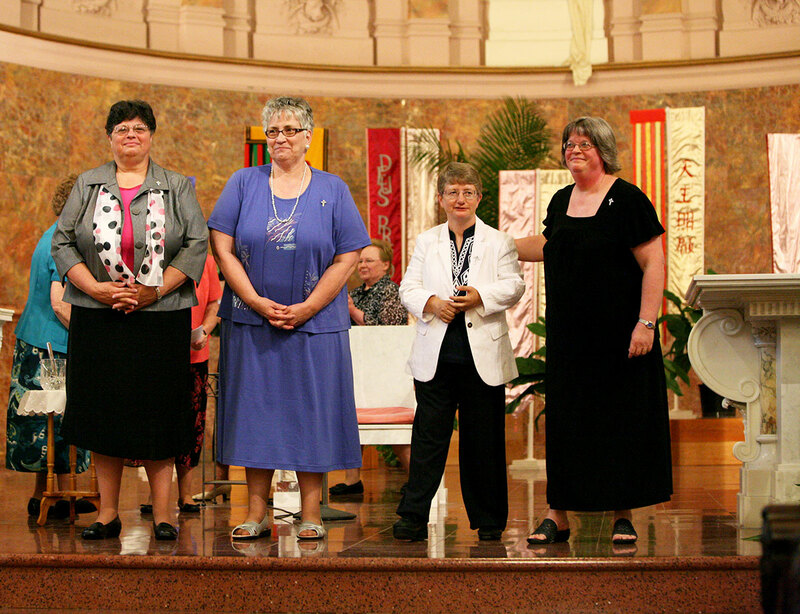 On June 30, four women professed perpetual vows as Sisters of Providence of Saint Mary-of-the-Woods. The profession of vows took place at the Church of the Immaculate Conception on the grounds of the order’s motherhouse in St. Mary-of-the-Woods. Providence Sisters Deborah Campbell, Laura Parker, Patty Wallace, Laura Parker, and Beth Wright came to the congregation from different paths and a variety of life experiences. Over the past several years, each has undergone spiritual formation, study and ministry as temporary professed sisters in preparation for this lifelong commitment. Providence Sister Deborah Campbell, a native of Chicago, has a bachelor’s degree in business education and a master’s degree in business administration. She is also a certified public accountant. She currently ministers as an auditor for Catholic Relief Services, where she leads auditing teams to impoverished countries to ensure donor funds are being used properly. Providence Sister Laura Parker was born in Chicago, and ministered as a parish nurse in River Grove, Ill., at the time of her entrance to the congregation. Sister Laura holds associate and bachelor’s degrees in nursing and a master’s degree in pastoral studies from Catholic Theological Union in Chicago. She currently ministers as a hospice chaplain in Des Plaines, Ill.
Providence Sister Patricia (Patty) Wallace was born in Indianapolis, where she was a member of St. Simon the Apostle Parish as a child and now attends St. Monica Parish. She holds a bachelor’s degree in elementary education and a master’s degree in library science. She currently ministers as an outreach children’s librarian at the Indianapolis Public Library. Providence Sister Beth Wright, who was not Catholic when she first felt the call to religious life, is a native of Beech Grove. After entering the Church, she began learning about religious orders and felt called to the Sisters of Providence. She has an associate degree in business and a bachelor’s degree in human services. She currently works as assistant administrator of Wabash Valley Health Center (also known as St. Ann Medical and Dental Services), a free health center for residents of Terre Haute and surrounding communities who would otherwise not have access to health care. A congregation of nearly 350 women, the Sisters of Providence motherhouse at Saint Mary-of-the-Woods is located just northwest of Terre Haute. St. Theodora Guérin founded the Sisters of Providence at Saint Mary-of-the-Woods in 1840. Today, Sisters of Providence minister in 19 states and the District of Columbia and Taiwan, Singapore and China.